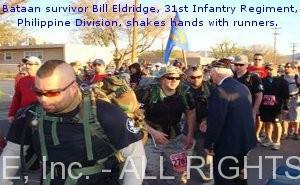 The Bataan Memorial Death March is held annually at White Sands Missile Range to commemorate the soldiers who gave their lives on Bataan, the U.S. Army’s first major battle of World War II. Participants follow a rugged marathon course through the New Mexico desert that is close to conditions found on Bataan during the actual Death March. A record 6,700 individuals, teams and military units participated in this year’s event. Forgotten Soldiers was featured at the Post Theater on Friday and Saturday nights before the march on Sunday. 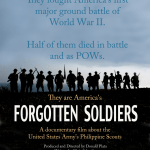 “Forgotten Soldiers,” narrated by Lou Diamond Phillips, tells the story of the Philippine Scouts, a little-known unit of the United States Army that formed the backbone of General Douglas MacArthur’s forces on Bataan. 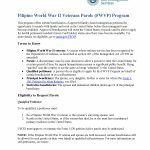 Along with National Guard units from the U.S. and the fledgling army of the Commonwealth of the Philippines, they held off the Imperial Japanese Army for five months at the beginning of World War II. In the film, ten Philippine Scout survivors describe the battles of Bataan and Corregidor, and the Bataan Death March, over photographs, reenactments, and actual footage of the Death March, much of the film captured from the Japanese at the end of the war. Despite their heroic efforts, the men were surrounded and starved out, and eventually forced to surrender. The film depicts their gallant stand, the bitter surrender, and their eventual triumph over the enemy. 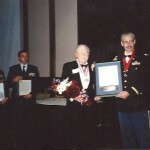 At each performance the audience of students, soldiers, civilians and marathon runners from across the United States broke into applause at the end of the film, but remained in their seats to be introduced to the handful of Bataan Death March survivors who were in attendance. At the Friday performance, White Sands garrison commander Col. Leo Puller presented the filmmakers with a White Sands Missile Range “Coin for Excellence,” for the effective way in which the movie tells the story of Bataan, the Death March, and the Philippine Scouts. 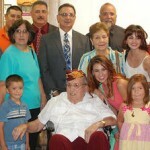 On Saturday night General John Ferrari, commander of White Sands Missile Range, joined the crowd with his family. 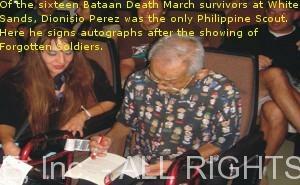 At the end of the film, when the lone Bataan survivor in attendance that night was introduced, “Mr. Dionisio Perez, 12th Medical Regiment, Philippine Scouts,” no further introduction was necessary–at the words “Philippine Scouts” the crowd broke into applause, whoops and whistles. Mr. Perez got up and waived to the crowd, and finally moved to the cent er aisle of the theater as the standing ovation continued. The announcer finally interrupted and thanked everyone for coming, at which point lines formed and the crowd spent the next half hour shaking Mr. Perez’ hand, thanking him, and taking pictures. When Mr. Perez left the theater he found twenty soldiers from the 62nd Signal Battalion, Fort Hood, Texas, recently returned from Afghanistan, waiting for him outside to get a group picture, in spite of the fact that they had to get up at 4:00 am to start their 26-mile trek in the desert. At the Memorial Death March the next morning, soldiers, marathon runners and spectators repeatedly broke out of the line of marchers to congratulate members of the film crew, who were standing near the start, and say how much they appreciated the film. Similar incidents occurred throughout the weekend. April 12 at the Consulates of the Republic of the Philippines in New York and San Francisco.